Before there was Google, and before there was Facebook, there was ABestKitchen. Welcome to the original online kitchen equipment company. We stock thousands of commercial kitchen products and restaurant supplies. We're a real restaurant equipment company with super-dedicated customer support, personalized service, fast order fulfillment, order tracking, and more, so you can buy with confidence at ABestKitchen. We were the first online restaurant equipment company, but we're not an online-only distribution business. We answer the phone - try it, and get to know us! We monitor the competition and continuously work to offer the lowest prices. If you see something priced lower elsewhere, please let us know and we'll match or beat that price. Most orders ship the same day. 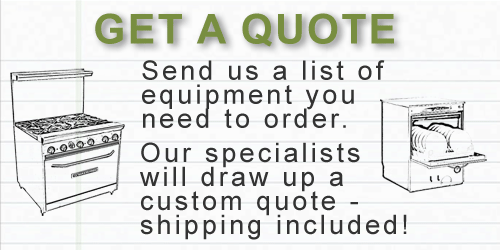 We stock equipment in our warehouses in and work with our manufacturers to ship directly if your order will arrive more quickly. We shipped our first online order in 1998 (it was a pizza knife to Wyoming). Back then, Amazon was known mainly for selling books and music, there were no camera-phones, people searched for information at places called InfoSeek, Lycos, & AltaVista, and nobody knew what a facebook was. We've grown a lot since, and we continue to add to the thousands of products we have available. Our staff is full of experienced professionals with knowledge gained from years of experience in kitchen equipment as dealers and restaurant owners. We're available to help, and we're happy to assist with your order to ensure you get a great product to suit your needs. Over the years, ABestKitchen has appeared in several popular TV Shows. We have warehouses in several locations in the USA. ABestKitchen began as the online extension of A-Best Fixture Company, which has been in the restaurant supply business for decades in Ohio. Throughout all the changes and growth, ABestKitchen remains a family operated business (with a lot of help). We take care to ensure you have a pleasant experience as our customer and we work hard to exceed your expectations. When you order at ABestKitchen, we not only provide fast shipping and keep you informed of your order's status & tracking info, we also proactively review each order for any potential issues, monitor your shipment, and, if needed, our friendly customer service team is ready to help ensure your order meets your expectations. We shortened our web address from ABestKitchen.com to AKitchen.com some years ago. Both addresses will take you to our secure website. The products we stock are mostly professional quality, heavy duty supplies and equipment that are NSF approved for use in commercial restaurants, bars, and other food service operations. These are the high quality, tough products that pro chefs, bakers and bartenders use when preparing food and drink for their guests. We also offer some tools and appliances that are not commercial-duty, but are perfect for use in home kitchens in our "Just for Home" sections.